Brown says that his background makes him a “stuff” guy, meaning that he spends much time examining problems with the operation’s existing fleet and trying to find new technology or products that will help minimize those problems. Brown has “Stephenized” — what employees call his changes and updates — his coaches by specifying or retrofitting emerging technology to improve reliability and reduce ongoing maintenance. Recent items include: tire pressure monitoring systems; seal-less, brushless coolant pumps; and brushless evaporator and condenser motors. He also added LED lighting, DriveCams and DirecTV. “We look at technology in the three industries we touch — school, transit and charter — and will take a product that is proven in transit, for example, and implement it in our charter and school vehicles if it’s cost effective,” says Brown. 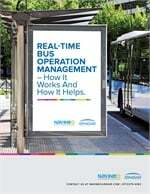 The operation is also taking part in a project for the New York State Energy Research and Development Authority that enlisted the help of a university and automation company to create a computerized engine block heater control system. This prototype system looks at vehicle schedules, the outside temperature and how much energy is used at a given time, and takes all those factors into account to manage the heaters so they are not on any longer than necessary or don’t all turn on at once. Brown says that the system has helped the operation save about 91 percent of the total electric bill that it would be paying if the block heaters, which are 1,500 watts each and total more than 90,000 watts when multiplied by the number of vehicles, were left on from the early evening until the next morning. Six years ago, Brown and his brother Robert, company president and founder, designed and built a 27,000 square-foot facility in Amsterdam, N.Y., that houses administrative offices and repair facilities for both the motorcoach and school bus operations. 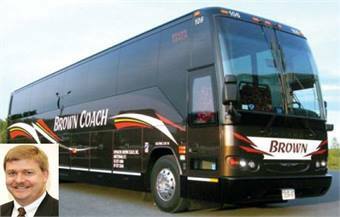 As far as the equipment side of the operation, Brown Coach took delivery of two Prevost H345’s this past summer, featuring a new paint scheme and graphics, as well as stuff “the customer would not even think twice about” under the hood that helps ensure a trouble-free trip. With five busy months a year, Brown says that his operation is increasing its marketing push to create a more visible presence and opportunities during the slower months, including increased advertising and actively partnering with convention and visitor bureaus, as well as, trade and marketing associations in the area.